Payot is a luxury, natural beauty brand which hails from Paris and as a fan of French skincare products, I was excited to try their Softening Eye Makeup Remover. The bottle is sleek and I like that it is transparent, making it easy to see how much product is remaining. My only complaint (and it's a minor one) is that I'd have prefered the convenience of a flip top instead of a screw on cap. I liked the opening of the bottle which is the perfect size to allow just the right amount of the fluid formula to be dispensed without wastage. 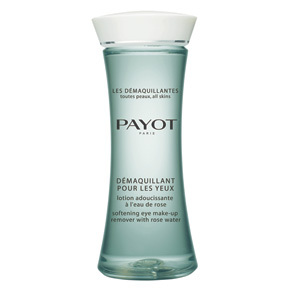 Payot Softening Eye Makeup Remover feels cooling upon application and I was impressed that it contains rosewater, making it a gentle option for those with sensitive eyes. Whilst it did the job, it isn't the most effective eye makeup remover I've used and I found that I really needed to "scrub" at my skin to remove the final traces of mascara. I don't tend to wear waterproof mascara so I can't comment on its effectiveness at removing this. There was no Eye Makeup Remover residue left on my eyes after use. Whilst Payot is a luxury brand, I find £16.50 for 125ml eye makeup remover expensive and I'd personally struggle to justify the price when I've previously tried perfectly acceptable, cheaper alternatives.